Multiple medical and societal advances are responsible for a fundamental shift in management of children with motor impairments -- from the search for normalization of movement to the achievement of meaningful function and participation in age-appropriate activities and occupations throughout life. Meeting this goal depends directly on being able to meet the required mobility demands. Assistive technology, especially powered mobility, makes it possible for even very young and severely involved children to have the motor skills that promote all other areas of child development. 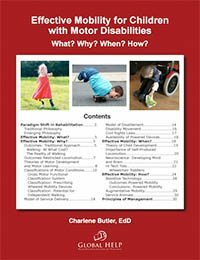 This HELP publication provides knowledge about the advances in the field regarding mobility options for children to help clinicians evaluate their own approach in light of this new information.